Fists of Ham! : anime triple-feature! super fun time let's go! anime triple-feature! super fun time let's go! when we moved out of my parents' house, we never picked up cable TV because it was yet another "new" bill we didn't want. The internet is a requirement for everyday life at this point though, so we got that at least. This pretty much makes Netflix and Hulu our only source of programming, but one thing those do have over traditional cable is the large amount of international programming (the relevance to this article being the huge amount of anime). I've never been a proper otaku, but I'll gladly watch an anime series if it's any good. 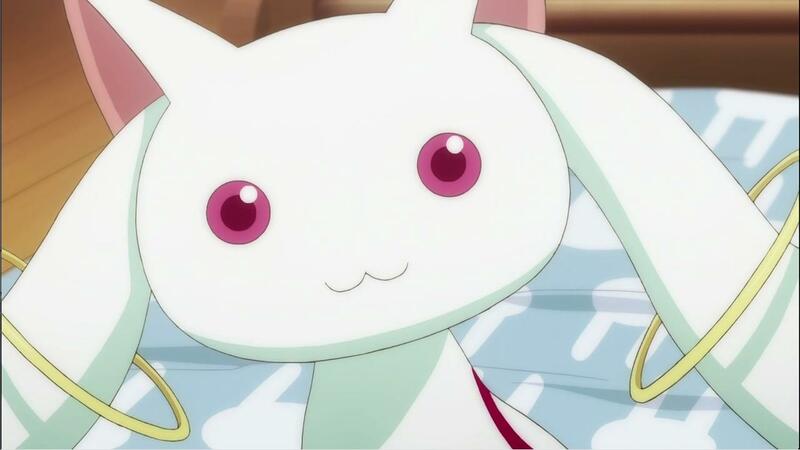 But the problem with that is sifting through metric F-ton of anime there is out there, to find anything worth watching. That changed a little bit with Netflix's ability to make recommendations according to viewing habits. I'd sifted through the recommendations it had because it was a while since I'd had a good show to watch. I don't normally do that, but I couldn't even remember the last time I was able to engage a series with any enthusiasm. For all the experience I've had in knowing what my favorite things are, it's still incredibly random to me; finding something I really like is usually just luck of the draw, and there's no telling what it will be or why I will like it. The fact that Netflix somehow makes better sense of it than I can is ... eerie. "You look bored, Dave... How about a dark Swedish sitcom?" This one's about a college-aged guy named Sato who lives alone in his apartment. He's a hermit, cut off from society and interactions with other people. He has no job, doesn't go to school, and is prone to fits of paranoia that revolve around conspiracy theories. The show follows him as a handful of new people in his life try to help him take the most basic steps toward living normally. You will watch him try (and often fail) to do things like leave the house, get a job, talk to others, and so on. Each of the new people is usually carrying around some baggage or damage of their own, and while not a "feel good" series proper, the show is about the slow process of dealing with it, usually with each others' help. It strikes a very delicate balance between having subject matter that is dark, while still having a ridiculous sense of humor, which is something I can usually get behind. You'll see more than your fair share of masturbation jokes mixed in topics like depression. In the next scene, they hide in bushes and photograph girls. Really. When it comes to Sato himself, I really like how they illustrate the paranoia factor while still making his character funny. He has an Eric Cartman-like ability to delude himself, and watching him invent reasons to not do things is hilarious and ... strangely relatable. I'm the type who imagines worst-case-scenarios automatically, and has a touch of anxiety over many normal types of social situations (the line at the grocery store, and such). While the show is definitely exaggerated in most cases, I actually think it does a good job of illustrating what that feels like. Instead of the fomulaic approach where this kind of problem can be solved all at once, the show takes it slowly. 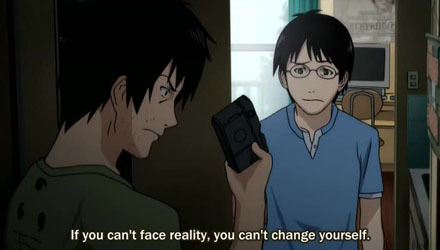 I'm told the source material (it was a book, then a comic, then a show) was written by a real shut-in, or "hikikomori". If you're a Type B, you will probably enjoy it a lot as well, but there's definitely appeal even if you're not. Give it a try below; full episodes are on YouTube. I didn't embed the video directly, because I don't know how to make the player big enough for comfortable viewing. This one is probably the most accessible of the bunch. I originally passed it up, because it didn't really look that interesting. Netflix had also only guessed I would rate it 4 out of 5 stars. To this I said 'meh' and carried on with my life. But then one day I was browsing Omegle (It's like Chatroulette, but it still actually works). The fellow I was chatting with noticed my Ghost in the Shell poster on the back wall. 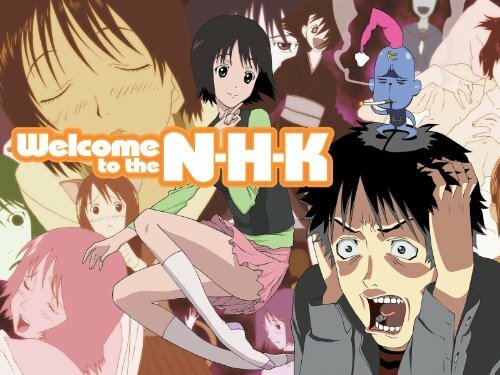 Since he noticed it on his own and seemed to like that movie too, I mentioned that I liked NHK and asked if he could recommend anything. Without hesitation he recommended this. It's an action cartoon, and has the most wide appeal of these 3 shows. 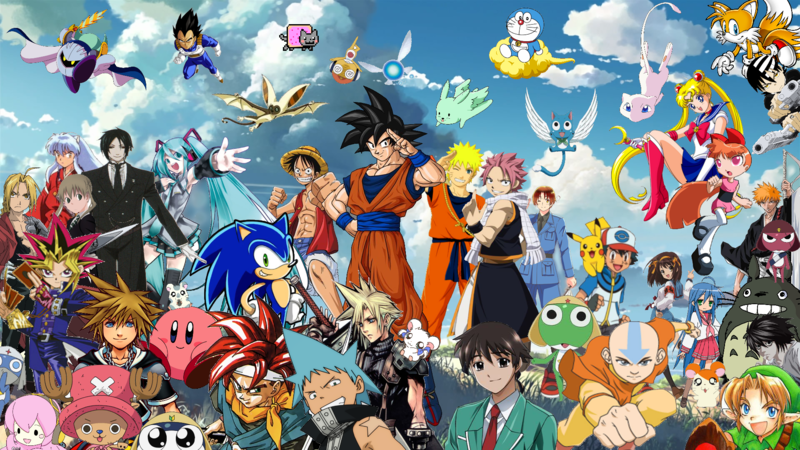 The way I typically describe it is that it's like Buffy the Vampire Slayer and Dragon Ball Z mixed together. It's got the awesome fight choreography and power-struggling of DBZ, with the [High School + Horror movies] feeling of Buffy. 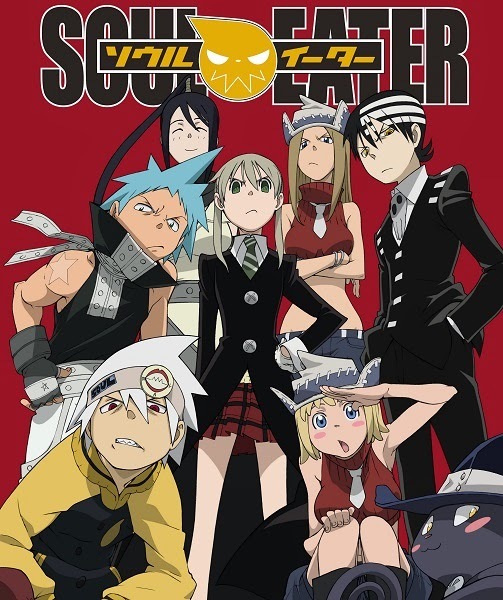 Where NHK is more or less supposed to take place in the real world, Soul Eater's is a fantasy world. It takes place at an academy run by Death, where high school students train to fight demons, witches, and such. It draws from many many sources to make an interesting mix; you'll see Dr Frankenstein fight witches, you'll see a ninja assassin try to find Excalibur, and you'll see the Grim Reaper's son explore a haunted Egyptian pyramid. The cast of characters is very diverse and likable, and creative in design. The 7 characters above comprise the principal cast, and they're all designed fairly stylishly, and are hilarious in their own ways. One is spectacularly arrogant, another is a straight-laced academic, and another has a dire emotional need for symmetry. Death himself is one of the goofiest characters in the show. This is going to be the toughest one to make a case for by far, for two reasons. One is that the picture above wasn't put there by mistake; that is the main cast of characters, and the visual style of the show. Two is that it's just one of those shows that is best viewed "fresh" with no prior information on it. To make the argument for the show even more difficult, YouTube doesn't have full episodes like it did for NHK and Soul Eater, so that I can just give you a link to Episode 1. If you're willing to just take my word for it and give the show a go, that's great. You can (and should) stop reading here; Netflix is waiting. Good on ya. If you need to be told more, I won't give too much away, but you'll miss out on some of the "fresh" experience. This show is not what it looks like. And I don't mean that in a "My Little Pony" way, where it is what it looks like, but it's still well-written. No, I mean the subject matter, tone, and plot are very much not what you'd expect. It takes the Sailor Moon format and does some new and fairly interesting things with it. Rather than basically giving you the life and adventures of the characters after they obtain powers, they spend a lot more time on the ramifications. They go into the risk (reminding you that the characters are constantly in real danger), potential buyer's remorse, isolation of not being able to tell anyone about it, and a few consequences that are unique to the series. It's very well done, and it's one of the darkest programs I've seen in recent years. The animation is superb and contiguous with that picture above, but changes to a very unique art style at certain parts. 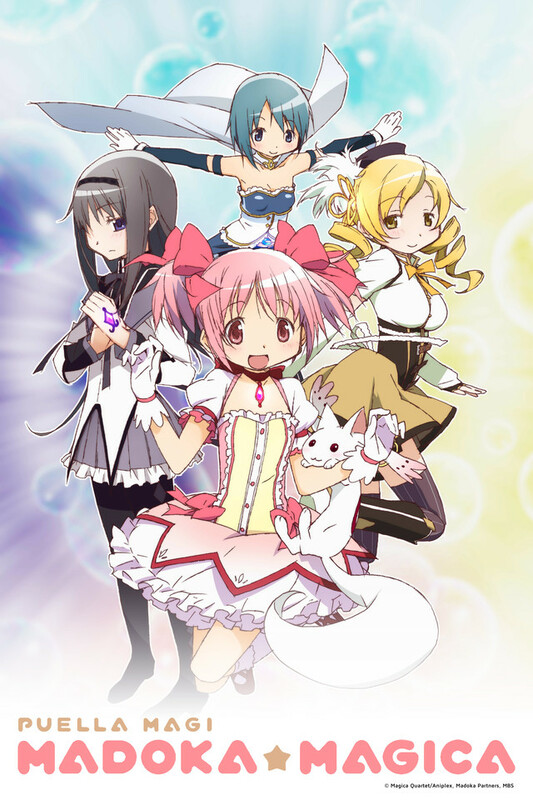 The girls' powers are granted to them by Kyubey (that white cat thing above) so that they can battle monsters called "witches" (they clarify why they're named that later on).When the girls go to the dungeons to battle, the settings change to a style that looks like it's made of construction paper. As I write I'm actually having a hard time coming up with words for it, so I think a YouTube video of one of the dungeon fights is warranted. There's no subtitles (obviously, Netflix will have them), but that's okay in this case. Enjoy! So, there you have it. Gushing complete.